Jeanne Kalogridis lives with her partner on the West Coast, where they share a house with two dogs. 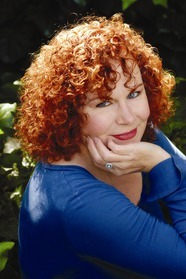 She is the author of The Borgia Bride, The Scarlet Contessa, The Devil’s Queen, and other dark fantasy and historical novels. Born in Florida, Kalogridis has a B.A. in Russian and a master’s in linguistics, and taught English as a second language at The American University for eight years before retiring to write full-time. Listen to this audiobook excerpt from Jeanne Kalogridis' novel The Devil's Queen: A Novel of Catherine de Medici. In her latest historical fiction bestseller, Jeanne Kalogridis tells the story of Catherine, the architect of the bloody St. Bartholomew's Day Massacre. And the spirited and ambitious woman who comes between them.